CALENDARS AS UNIQUE AS YOU ARE — Let Leech Printing create a custom wall, desktop or memo calendar for your company or organization, or for personal use. 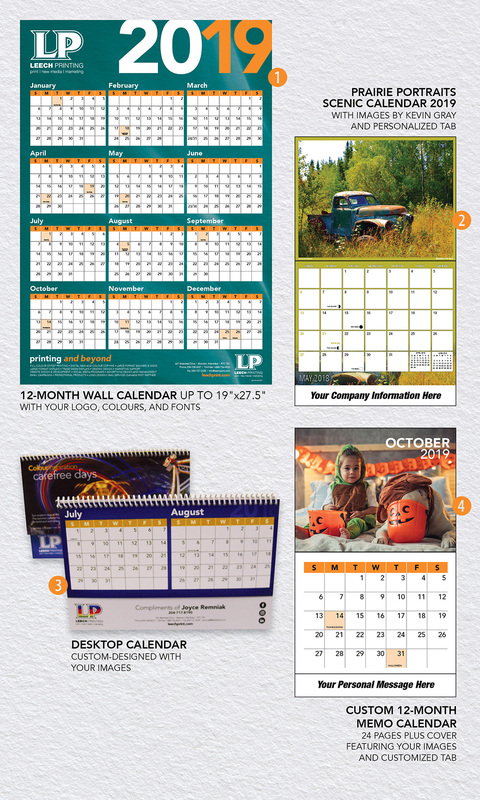 Calendars can be designed to your exact specifications, using your images, logo, colours, and fonts. Calendars are a great client giveaway during the holiday season, and they also make great gifts and keepsakes for Christmas, birthdays, anniversaries, family reunions, graduations, and other celebrations. Available in any quantity. To request a quote for a custom wall, desktop, or memo calendar, complete the form below. Fields marked with a * are required. Our 2019 Prairie Portraits Scenic Calendar features 12 monthly nature images by Kevin Gray. The calendar tab can be personalized with your logo, contact information, or a personal message. Follow this link to order 2019 Prairie Portraits Scenic Calendar. Please provide any additional information about your calendar that will help us to provide a custom quote.